While I was mowing a lawn this afternoon I noticed a tiny little thing jump in front of the mower. It was about the size of a dime and at first I thought it was a grasshopper or maybe a small toad, but when I looked more closely, I discovered it was a tiny tree frog. Surprisingly, it wasn't at all afraid of me. When I tried to pick it up to move it out of harms way, it simply climbed onto the palm of my hand and then just climbed around on my arm. It's got a pretty good sticky grip with its feet. This is a picture I snapped of it climbing a small sappling. Nice picture. 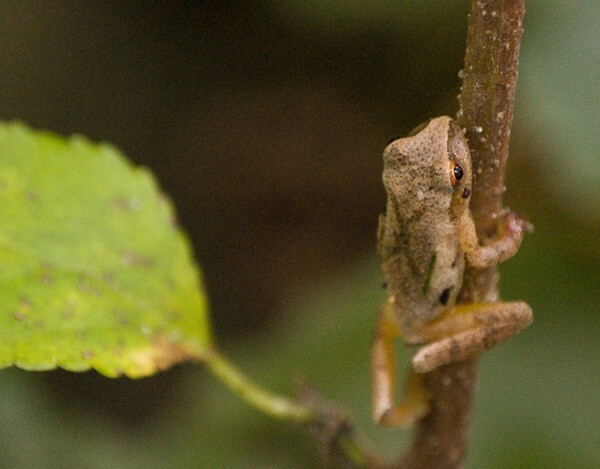 It's a spring peeper. Thanks Linda! I can always count on you to accurately identify the animals I run across. And far more than most people need to know about peepers can be found here.